It is no wonder that Hawai’i is the ultimate go-to destination for surfers and golfers. The islands of Hawai’i are rich with magnificent golf courses. From Maui’s PGA course Kapalua Plantation to Oahu’s PGA course Waialae Golf, Hawai’i has numerous stunning golf courses that will take your breath away. We’ve decided to create a bucket list for you to help plan (or inspire) your golf trip to Hawai’i, the state of Aloha. As the venue of the PGA opening tournament in January, Sony Open, Waialae Country Club is a world-class golf course located on Oahu. The course offers wide fairways and a pleasant golfing experience. 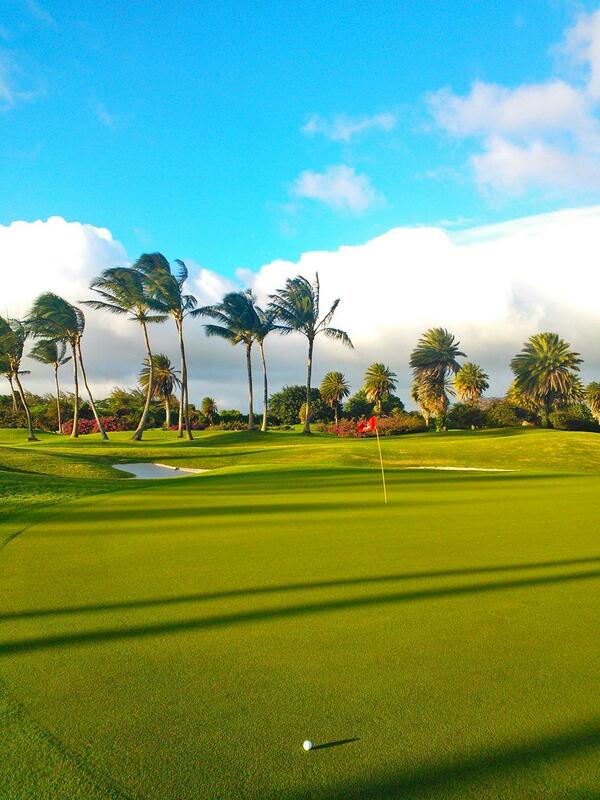 The course represents Hawai’i with plenty of coconut trees and gorgeous views to the ocean. 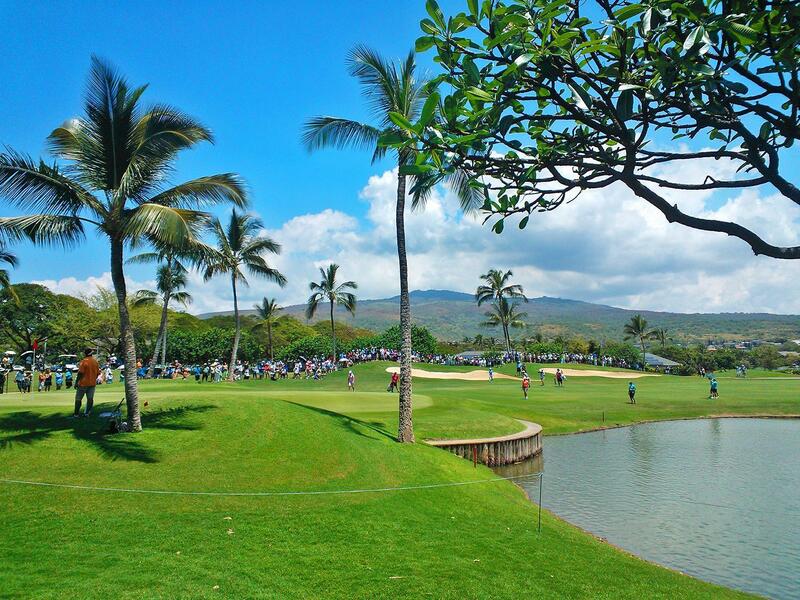 On the 7th hole, you can even spot four coconut trees forming a big ”W” to represent Waialae… now that’s impressive! The 18th green at Ko’olau. The 18th at Ko’olau Golf is a monster par 4. The Kaneohe Klipper is one of the world’s best military courses, located in the Marine Corps Base in Kaneohe, Oahu. During your round, you’ll see surfers enjoying the surf break next to the 13th hole. If you’re lucky and if you’re during the right time of the year, you might even spot a few whales in the ocean. 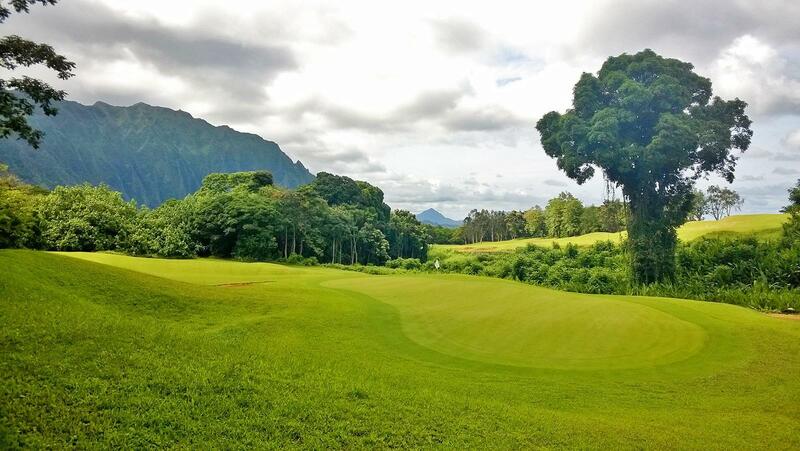 Kaneohe Klipper is not only a spectacular golf course, the views are some of the best on the island. It is no wonder some call it the Pebble Beach of Hawai’i. The 13th green at Kaneohe Klipper. 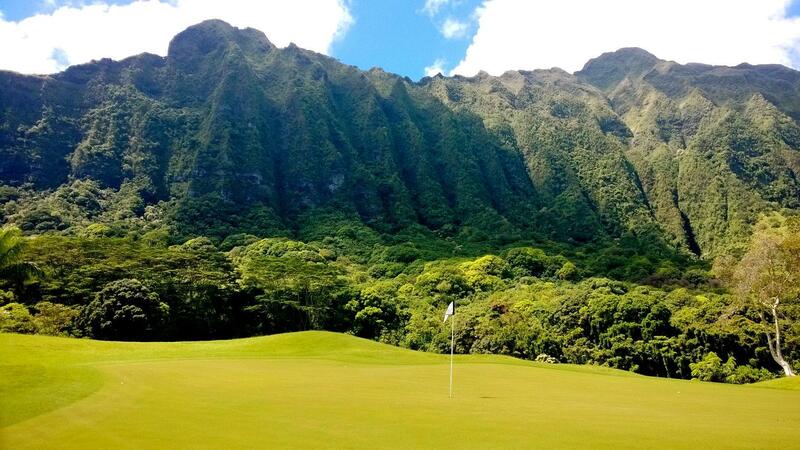 If you’ve watched the Jurassic Park movies, then you’ll have to play a round at Royal Hawaiian Golf Course. From the moment that you drive through the jungle and to the club house, you know that this course is going to be special. The course requires true target-golf, as the ravines are present on nearly all of the holes. This course is not only an unforgettable golfing experience, but it also feels like T-Rex is watching you, since you are actually on the filming location of Jurassic Park. Mid Pacific is a private country club located in Lankai on Oahu’s windward side. The fairways and greens are in the best possible condition. The golf course has attracted some of the world’s top golfers, prestigious golf tournaments and even U.S. Presidents. 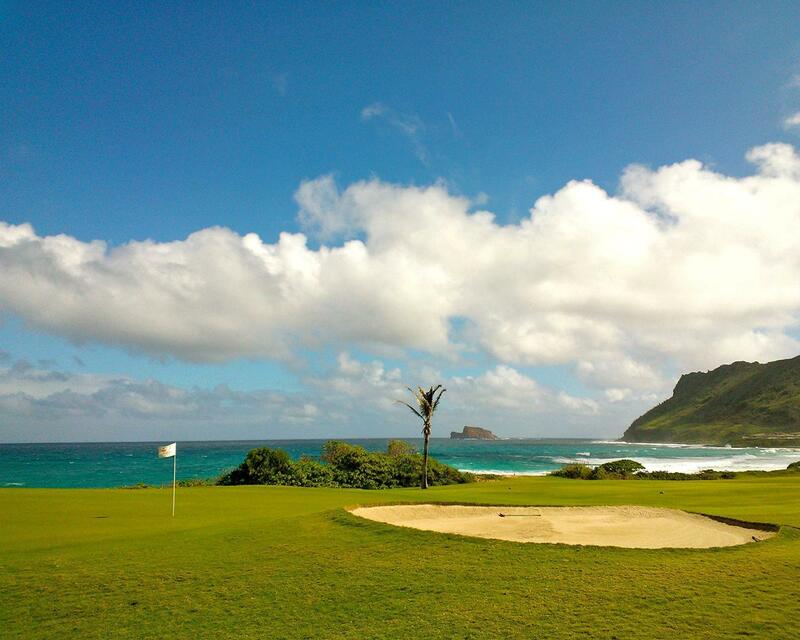 During your golf round you’ll get to enjoy views of the Ko’olau mountains, the turquoise ocean and the Mokulua Islands. This course is a piece of paradise. 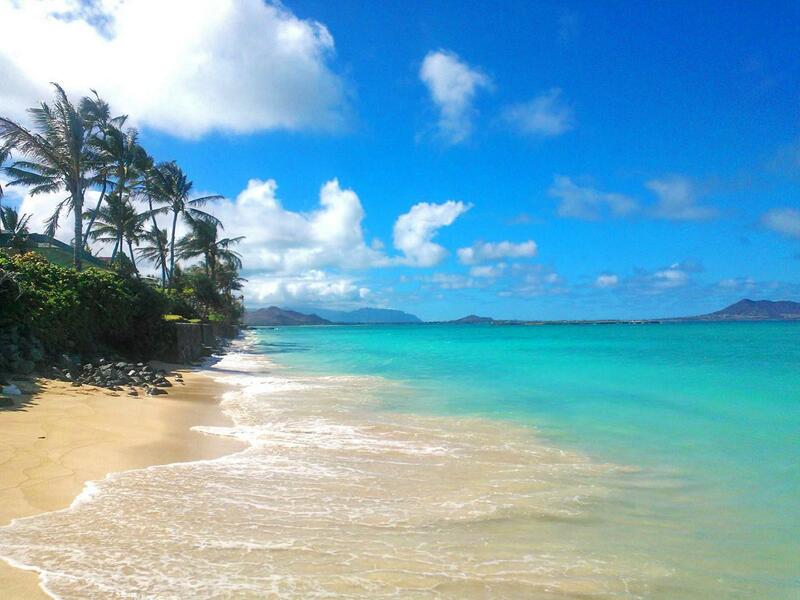 Lanikai beach is right around the corner from the golf course, so why not go to the beach after golf? The North Shore is well-known for the legendary surf breaks of Pipeline where you’ll spot Billabong Pipemasters and other surf contests in the winter months. Turtle Bay is a unique resort on the North Shore with two golf courses: Fazio and Palmer. The Palmer Course has been ranked as one of the top 100 courses in the US. It’s located on the northern most tip of Oahu and offers outstanding views to the ocean. 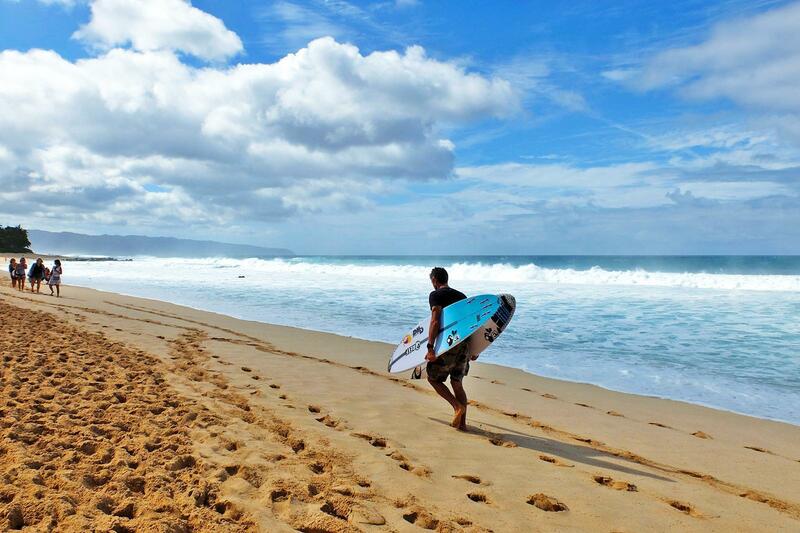 After the round, you can enjoy some surf atmosphere in Haleiwa, where there’s plenty of local shops and restaurants. Billabong Pipemasters on the North Shore of Oahu. The home of the LPGA Lotte tournament in April, Ko’olina is a beautiful & challenging resort-style golf course located on the West side of the island of Oahu. 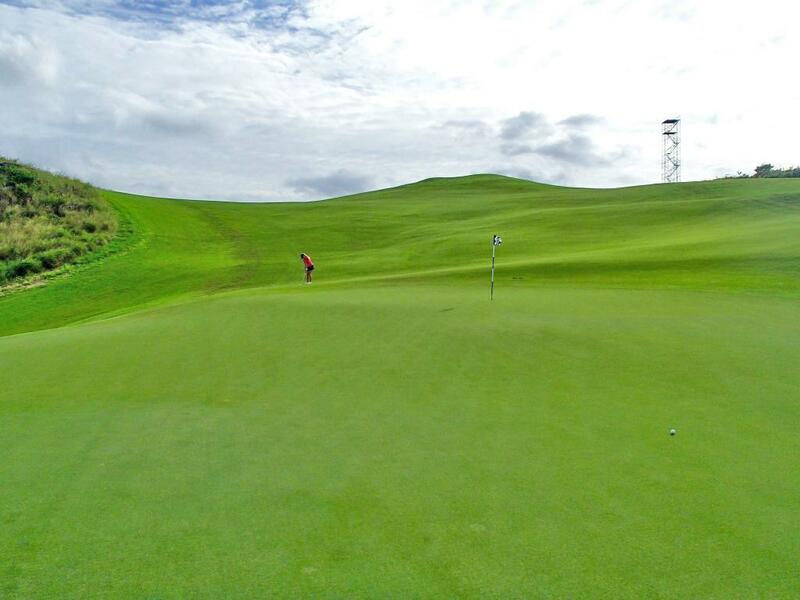 This course is pleasant to play and offers a picturesque golfing experience. It’s a short walk away from the Disney Resort as well. LPGA Lotte Championship at Ko’olina. The Plantation Course at Kapalua is the host of the PGA tour event, Sentry Tournament of Champions. The course has been selected as the #1 course in Hawai’i. Designed by Ben Crenshaw and Bill Coore, the course is located on the slopes of the West Maui Mountains and offers dramatic ocean views from each hole. You’ll notice that the greens have hidden breaks… just remember that most greens slope towards the ocean (even if your eyes don’t agree). Plantation Course at Kapalua Golf, Maui. 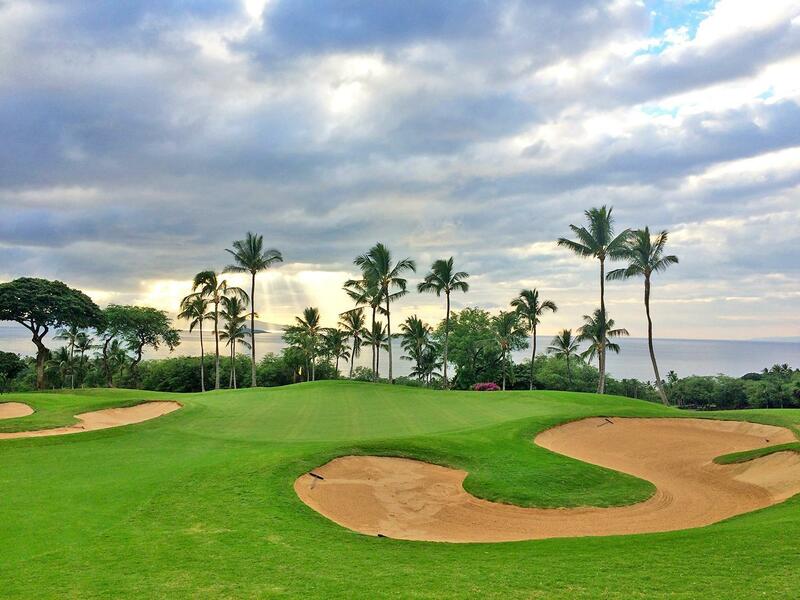 The Gold Course at Wailea Golf Club on Maui was created by architect Robert Trent Jones II. The course is a true test to course management, as you are required to make exciting risk-reward choices throughout the round. The course offers magical views of the ocean, and if you happen to be playing during the whale season, you might get lucky and see a whale out in the ocean. While you’re in Hawai’i, I recommend visiting the largest island in Hawai’i, Big Island, which includes four active volcanoes. The landscape of Big Island is unique from the other islands, as there is lava rock next to the highways and the scenery is rather dramatic. 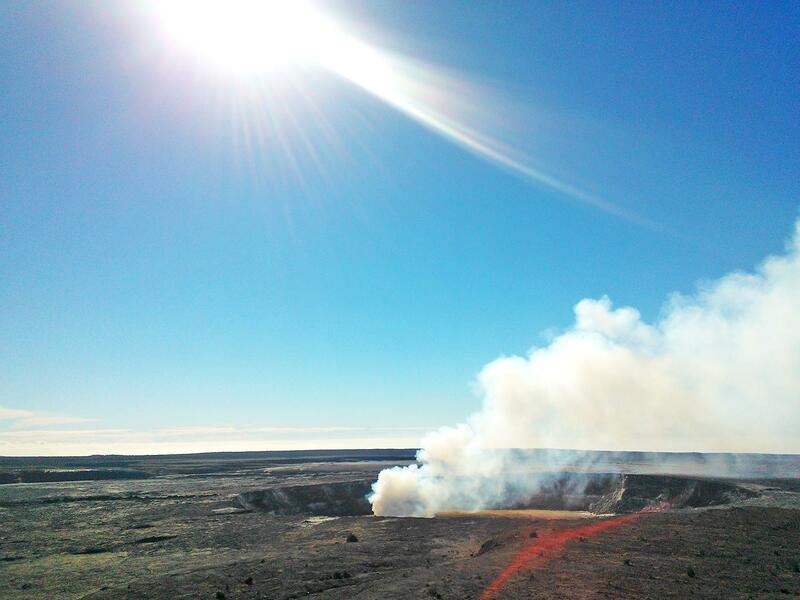 Kilauea Volcano on the Big Island. Located on the Big Island of Hawai’i, Waikoloa Beach Resort is resort-style golf at its finest. The signature 7th hole is simply unforgettable, as you are hitting towards the Pacific Ocean with lava fields bordering the fairway. When you’re on the green, you are basically putting with waves crashing to the rocks on both sides of the green. This is one of the places on Earth that simply take your breath away. The course is surrounded by volcano lava rock, so make sure not to miss the fairways. And speaking with experience, I do not recommend trying to hit the ball out from the lava rock. You might end up with a broken club or even a broken ankle. Even though the lava rock looks intriguing, remember not to take any piece of it with you, because it is very sacred. Local Hawaiians can tell you more about Pele’s curse: any visitor who takes rock or sand away from the islands will suffer bad luck until the native Hawaiian elements are returned. Poipu Bay is located on Kaua’i, the Garden Island of Hawai’i. The lush vegetation, abundant rainfall and indigenous plants and wildlife make Kaua’i such an exotic island. 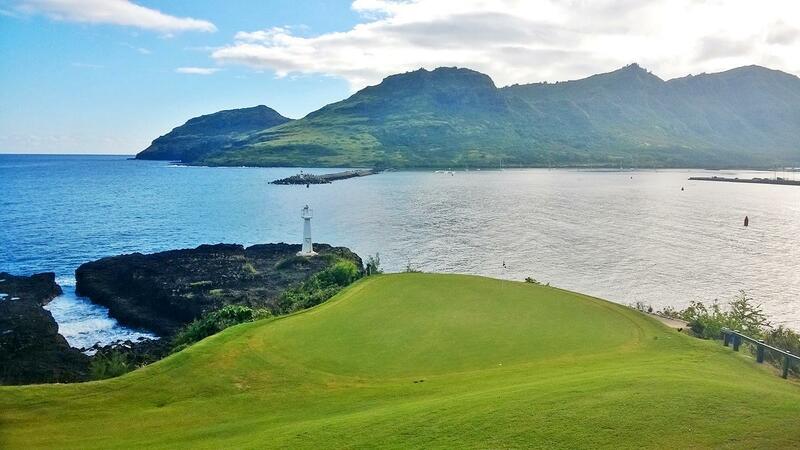 Even though Kaua’i is known for the high amounts of rainfall, the southern tip of Kaua’i where Poipu Bay Golf is located experiences sunshine almost every day of the year. The back nine at Poipu Bay Golf Course is exceedingly memorable with holes 15, 16, and 17 played alongside the Pacific Ocean. Last but not least on our bucket list is Kaua’i Lagoons. The championship Jack Nicklaus signature design 18-hole course provides golfers with challenge and spectacular mountain and ocean views set in the lush setting of Kaua’i. How could anyone resist Hawai’i? It’s time to start planning that trip to paradise and adding courses to your bucket list on GameBook.